The stock is retesting its highs ahead of Tuesday's earnings release. The rally in Nvidia (NVDA - Get Report) began in April last year and the stock has gone on to a 386% gain since then, but there's another stock in the graphics and artificial intelligence semiconductor space that has done even better. Advanced Micro Devices (AMD - Get Report) is up 408% in the last 16 months and is retesting its all-time highs as the company is set to report earnings after the close of trading Tuesday. The price action on the daily chart and the technical indications suggest a potential 17% move higher from its current level. The $15.00 area has supplied resistance for the last six months and, after making several attempts to break above this level earlier in the year, shares failed and broke under their 50-day moving average, moving back down to retest the rising 200-day moving average and the long-term uptrend line. They were able to hold this support and bounced back up last month to retest resistance, in the process forming a bullish cup-and-handle pattern below the $14.50 rim line. The price objective of this pattern is measured by taking the depth of the cup and adding it to the rim line and it targets the $17.00 level, which would be a 17% move in the stock price. Daily moving average convergence/divergence is overlaid on a weekly histogram of the oscillator and is moving above its center line on both time frames. These readings represent positive price momentum and short-term trend direction. The accumulation/distribution line is trending above its rising 21-period signal average, suggesting the stock is being accumulated ahead of the earnings report. 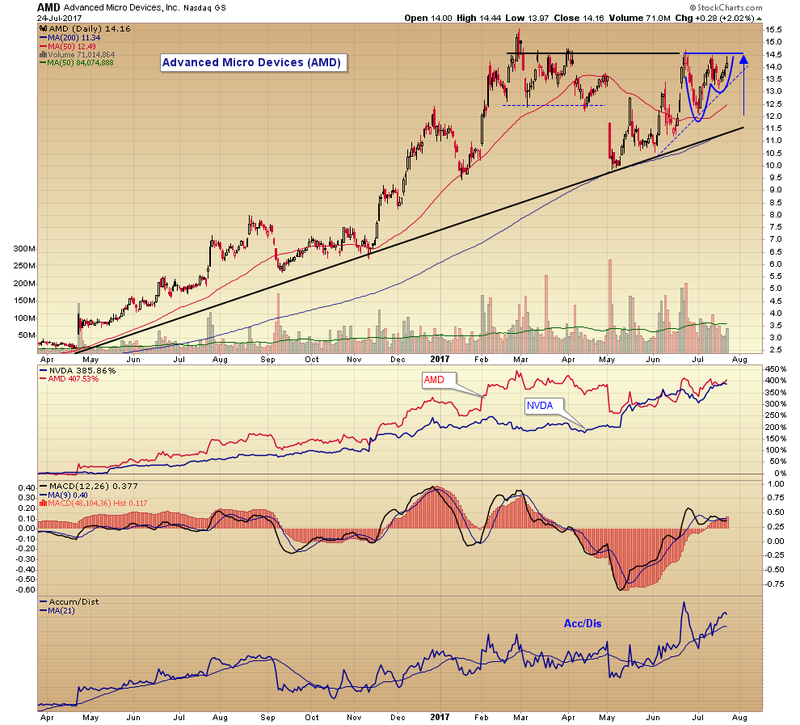 Advanced Micro is a buy after an upper candle close above the $14.50 level, using a trailing percentage sell stop. AMD's shares rose 4.2% to $14.70 on Wednesday. Starbucks Has an Alarming Problem That Even Its Fans Must Admit Has to Be Fixed -- and Soon! The author is an independent contributor and at the time of publication had no positions in the stocks mentioned.